Opened in 1917 as the Star Theatre. It was renamed the Valencia Theatre in August 1929, and then to Fox-Valencia Theatre when the Fox West Coast Theatre Corp. purchased it later that year. In 1941, it became known simply as the Fox Theatre. The theater closed in 1987, but then reopened in 1992 as the Youth Center Theatre, under the management of the Huerfano Youth and Arts Foundation. 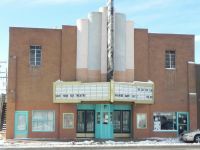 This movie theater is near Walsenburg, Farista.